World darts champion Rob Cross gave further evidence of returning to form by reaching the final of Coral UK Open Qualifier 5 today (Saturday). The St Leonards-based thrower made it 11 wins in two days by going one better than his run to the semi-finals of Qualifier 4 in Wigan yesterday. Cross began the afternoon with an amazing 118 average in a 6-2 defeat of Jan Dekker before seeing off Nicholas Bell 6-4 and then edging out Stefan Nilles 6-5 in the last 32. The world number three was a 6-3 winner against Chris Dobey in the last 16 and then overcame Steve West 6-4 in the quarter-finals. Cross, nicknamed Voltage, hit back from 4-3 down to beat world number two Peter Wright 6-4 in a splendid semi-final, sealing victory with a brilliant 156 checkout. The 27-year-old then opened up a 4-1 lead in a high quality final against Australian hot prospect Corey Cadby before Cadby won five successive legs to triumph 6-4. Cross broke throw in the opening leg thanks to an 88 finish and hit double six to lead 2-0. 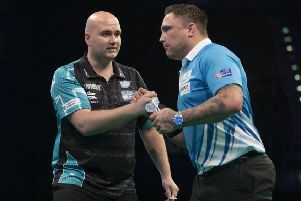 Cadby produced a 13-darter to open his account only for Cross to take out 85 for 3-1 and then produce an 11-darter, featuring a 180 and 96 finish, to break for a second time. Cadby got one of the breaks back with an 11-darter, a 13-darter made it 4-3 and Cadby landed a 161 outshot to level at 4-4 after Cross missed the bull for a 121. After hitting the front for the first time at 5-4, Cadby produced a 134 checkout in the 10th leg to seal his second victory over Cross in nine days having also beaten him in Qualifier 1. Cross, who yesterday secured his place at the Coral UK Open TV Finals at the Butlin’s Minehead Resort next month, will be hoping for another good run in the final qualifier tomorrow.